I have written and spoken often about the huge importance of instrumentation in an application. PeopleSoft introduced internal instrumentation to PeopleTools 8.44 for its own Performance Monitor that works on any platform. Since PeopleTools 7.53, when running on an Oracle database, PeopleTools also calls the Oracle supplied package dbms_application_info package to set the module and action for the session. The values set were not particularly useful, so I wrote a PL/SQL package (psftapi) and trigger to set the module and action attributes when a process started. In PeopleTools 8.50 this instrumentation was enhanced to set module and action to the component and page name in the PIA. These values appear in Oracle Enterprise Manager and Active Session History (ASH). They can be used to profile components. Now, in PeopleTools 8.52 Application Engine has been enhanced to set the action to the full Application Engine step name. To illustrate what happens, I have produced an Oracle Extended SQL Trace for the process, but I have shown only the lines in a SQL Trace file with 3 asterisks. So you can see MODULE and ACTION being set (and some other timestamp information). The lines in italic were emitted when module and action were set by my psftapi package, in which I simply set the MODULE to the Application Engine program name. Application Engine also sets the MODULE attribute. In the above example it was set to PSAE.PSPMCSOSUM.1448. The string is composed of three parts. PSAE indicates that it was running Application Engine. It sets the same value for both stand-alone and Tuxedo server Application Engine processes. 1448 was the operating system process ID of the Application Engine process. This value is recorded in the column SESSIONIDNUM on the table PSPRCSQUE. The inclusion of the SESSIONIDNUM is useful because it is possible to determine the process instance. If you have multiple instances of the same Application Engine program running concurrently, you can work out which ASH samples correspond to which process instance by matching the session ID. Unfortunately, this change to MODULE also means that it is no longer possible to enable trace by setting a watchpoint (as I blogged previously) now does not work with Application Engine because it is not possible to predict the value of the SESSIONIDNUM in MODULE! I am testing with 8.52.12 and have found a significant problem. Application Engine doesn't set the action on DO SELECT statements. The first statement in the trace extract below does come from PSPMCSOSUM.MAIN.CTL PeopleCode, however, the second SQL statement actually comes from PSPMCSOSUM.MAIN.SELECT.D, but the absence of another action line would lead you to believe the statement came from the preceding PeopleCode step. However, MAIN.SELECT.D duly appears in the AE batch timings report. This is a serious problem If you profile the top SQL statements in an Application Engine (using either ASH as I have done above, or by profiling a trace file and looking for the top SQL statement by searching through the raw trace file) it will lead you to the wrong conclusion! Time spent in PSPMCSOSUM.MAIN.SELECT.D will be accounted as having been spent in PSPMCSOSUM.GETCNT.CNT.P. It is not until you look for the specific SQL statement in Application Designer that you realise that the source code doesn't match the instrumentation. Nevertheless, this instrumentation is a very welcome and significant improvement for Application Engine. It will help to localise performance problems. However, until the omissions are fixed, you will need to be aware of their implications and avoid falling into the traps. My thanks to Wolfgang Breitling for telling me about the feature. A longer version of this posting, with all necessary code and a demonstration test, is available as a technical note on the Go-Faster website. I am working with two different PeopleSoft customers who have had challenges with the size of the temporary tablespaces. Critical batch processes have failed because they have exhausted space in the temporary tablespace. Another system has 64 GB in the PSTEMP temporary tablespace used by SYSADM. All other users already use another temporary tablespace, but PeopleSoft processes sometimes still fail because most of the temporary tablespace has been consumed by an adhoc PS/Query process, and there is nothing left for other processes. This system also has other Oracle database users with read-only access, but here they use the default TEMP temporary tablespace. If a PeopleSoft system has database users executing adhoc queries, then allocating those users to separate temporary tablespace is a sensible first step. However, in this document I suggest going further. I propose switching some PeopleSoft processes to use a different temporary tablespace. Regular PeopleSoft processing will continue to use the first temporary tablespace, but adhoc queries will use the second temporary tablespace. Thus, the first temporary tablespace can be sized to cater for normal processes safe in the knowledge that it won’t be consumed by adhoc queries and you won’t get failures due to space errors. Meanwhile, the second tablespace can be limited to a reasonable size and queries that make unreasonable demands on the temporary tablespace will error. When a session sets CURRENT_SCHEMA to another schema it uses the temporary tablespace assigned to that schema rather than its own. From PeopleTools 8.51 you can direct read-only activity via a second connection to a standby database. If you are using Oracle Active Data Guard you must configure something that looks like a second PeopleSoft database in another schema, but which actually is composed of database synonyms that point to the first schema. Create a second schema (I'll call it SYSADMRP) in the same database, and specify a different temporary tablespace for the user. Create synonyms in the second schema for every table and view in the PeopleSoft (SYSADM) schema. If you are not using Active DataGuard or are below PeopleTools 8.51 then you can set CURRENT_SCHEMA with two triggers. Create an AFTER LOGON trigger that will set CURRENT_SCHEMA to SYSADM for PSQRYSRV query server processes only. Create another trigger to set current schema for the application engine process that runs scheduled queries (you might want to add others to this list). PS/Queries will always use the standby connection and hence the alternative tablespace. Batch processes can be marked as read only to make them connect to the standby connection. Remember that you must use PSAESRV processes. 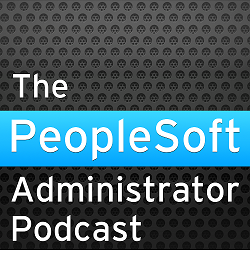 If you want to make specific PeopleSoft components use the alternative temporary tablespace then you can only do this by perverting the PeopleTools Active Data Guard support and marking components as read only. Now, you can choose an appropriate size for the one temporary tablespaces that will be sufficient for the regular operation of the application. Adhoc queries will use alternative temporary tablespace. You might choose to set a temporary tablespace size that may still cause queries to fail with a temproray tablespace error, but at least that won’t cause business-as-usual processes to crash. You could even choose to run with three temporary tablespaces, one for PeopleSoft processes, one for PeopleSoft queries, and one for adhoc users accessing the database directly.